Boy howdy, have I been looking forward to this interview. 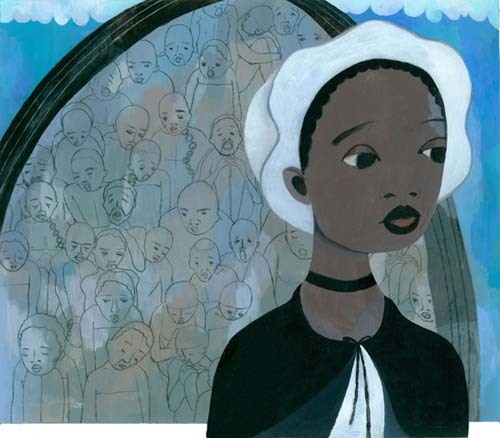 Sean Qualls is one of my favorite new illustrators, one whose career I follow with great and geeky interest. 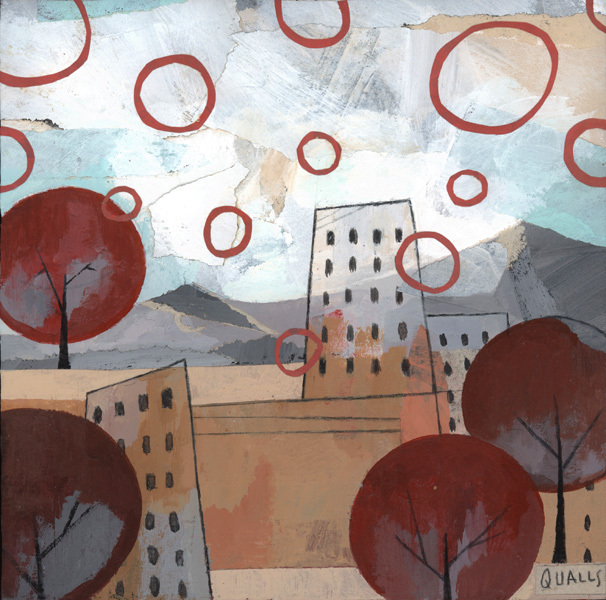 His mixed-media artwork (mostly painting, drawing, and collage) never fails to surprise, and I must add, as odd as it might sound, that I particularly love his consistent use of circles. 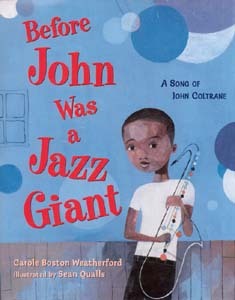 (See the sketches and spreads below for Dizzy and Before John Was a Jazz Giant as excellent examples of my point, what with the “the sounds dreamily dancing through the air amid streaming ribbons of music,” as School Library Journal put it in their review of the latter title, a 2009 Coretta Scott King Illustrator Honor Book.) And, in the words of Kirkus, Sean’s got his own unique “sonic iconography,” and he’s got it down pat. 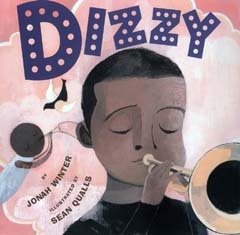 When The Horn Book named their 2006 “fanfare,” the best books of that year, Dizzy—written by Jonah Winter and illustrated by Sean—was included. 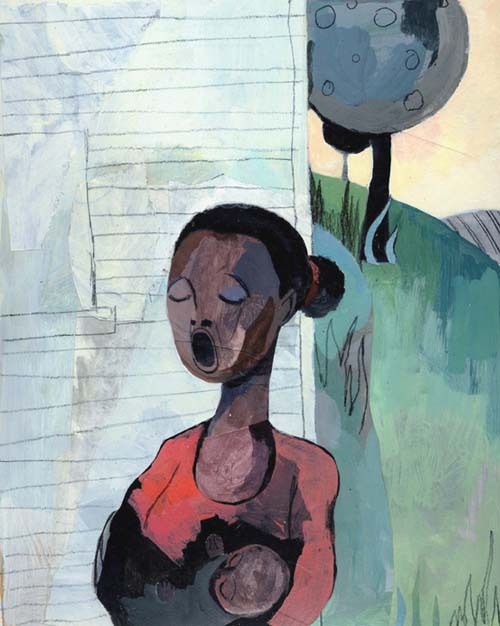 “Qualls’s large mixed-media art provides a dexterous combination of narrative and emotion,” the review had said. 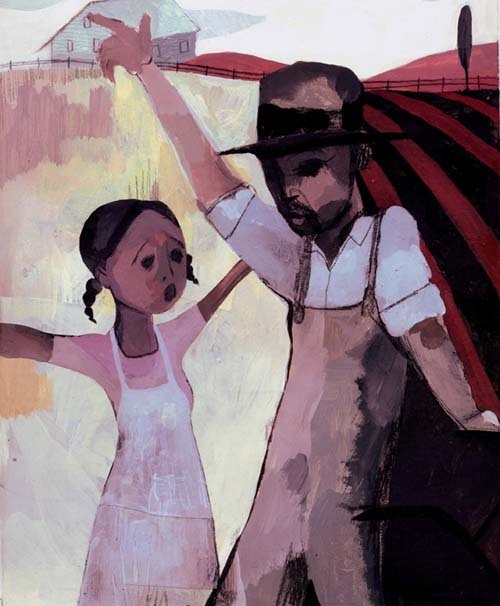 And we see this in his other illustrated titles, as anyone knows who has seen his emotionally-compelling charcoal work in The Poet Slave of Cuba: A Biography of Juan Francisco Manzano, for which Margarita Engle won the 2008 Pura Belpré Award, or his acrylic and collage compositions from last year’s Phillis’s Big Test by Catherine Clinton. 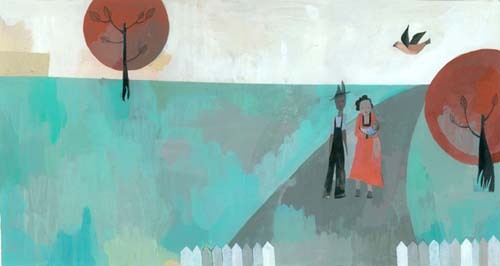 Sean—who has also created art for magazines, newspapers, and advertisements and who, as you can see at his site, draws inspiration from “an array of influences such as movies, television, childhood memories, aging and decaying surfaces, old buildings, architecture, nature, folk art, fairy tales, americana, black memorabilia, outsider art, cave paintings, collectibles, african art, golden books, vintage advertisements, psychology, mythology, science fiction, music, and literature”—tells me that, if all goes as planned, he’ll be finishing three new titles this year. This is good news for fans. So, let’s get to our breakfast chat and hear about it. “I’m probably a very boring breakfast date.” Sean told me. “I don’t really eat breakfast. Sometimes I have a smoothie, a cup of tea, or a bowl of granola. Lunch is my first meal of the day. My wife and fellow illustrator, Selina Alko, loves breakfast and our son, Isaiah, loves pancakes, so once in a while I try to accommodate them.” Well, I’ll gladly join him for a smoothie, and I thank him for stopping by. Note: Some of these spreads have been re-sized to fit within the blog’s template but are linked to the original file. Click on those to see them larger and in more detail. 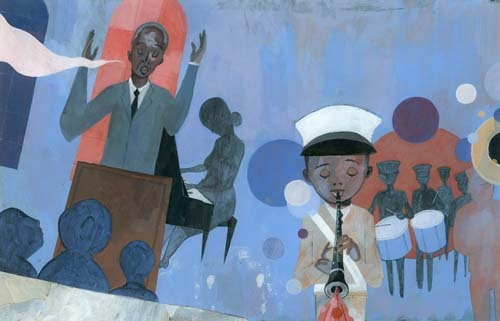 7-Imp: Are you an illustrator or author/illustrator? 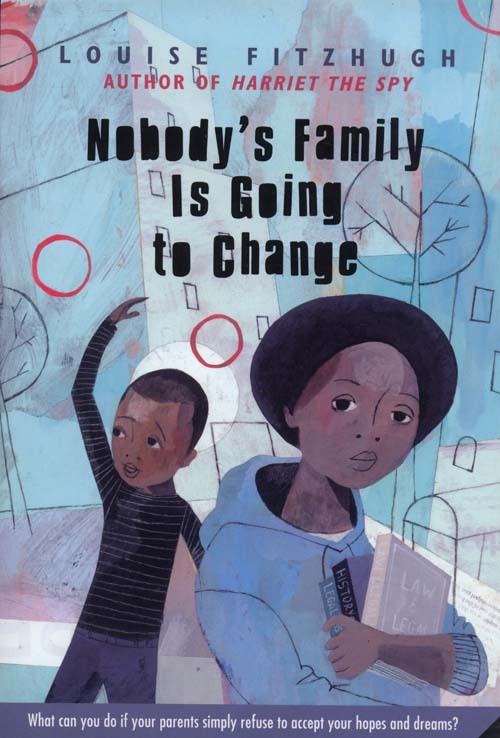 7-Imp: Can you list your books-to-date? 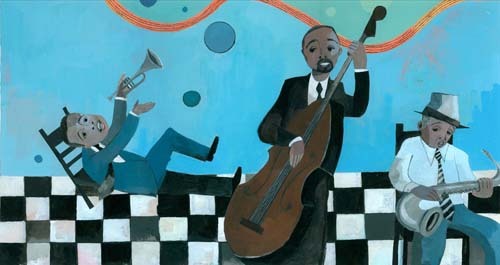 7-Imp: What is your usual medium, or -– if you use a variety -– your preferred one? 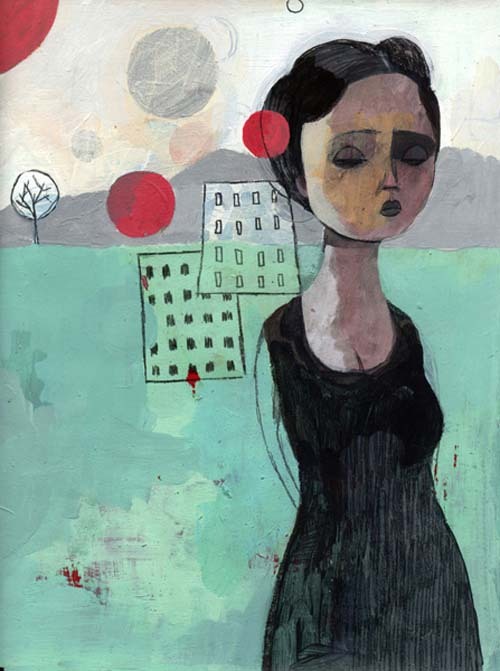 Sean: Acrylic, pencil, cut/torn paper, and sometimes tempera. 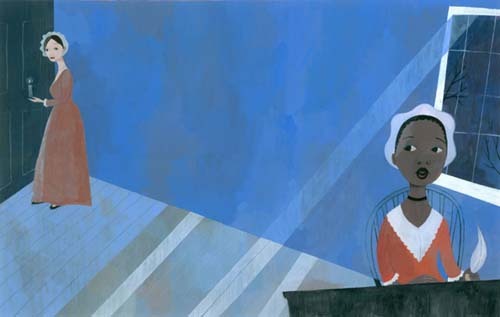 7-Imp: If you have illustrated for various age ranges (such as, both picture books and early reader books OR, say, picture books and chapter books), can you briefly discuss the differences, if any, in illustrating for one age group to another? 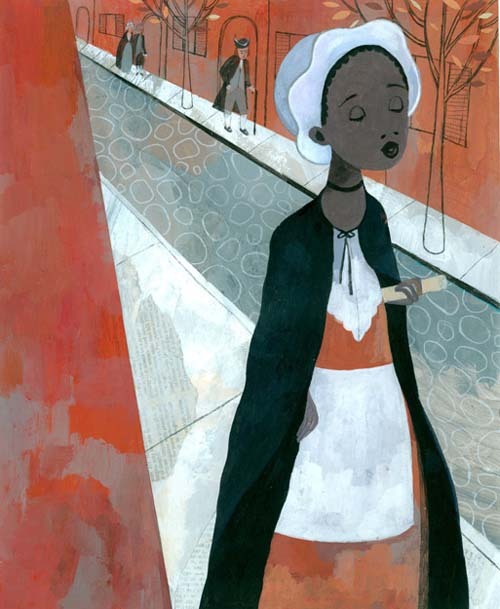 Sean: I still consider myself new to the world of illustrating picture books and feel like I’m just beginning to learn what approach works best for a particular book. Non-fiction books that I’ve illustrated for older kids may be a bit darker in palette, partially due to the content. My three-year-old son, Isaiah, gave me some interesting feedback just recently. 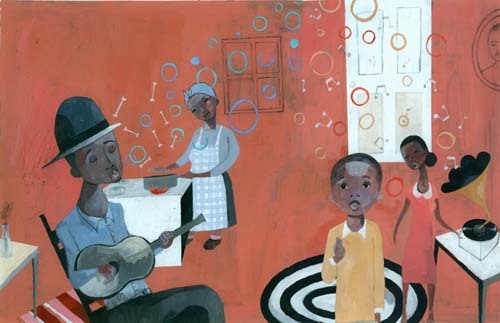 He informed me that when he illustrates picture books, he will use bright colors, unlike my books. 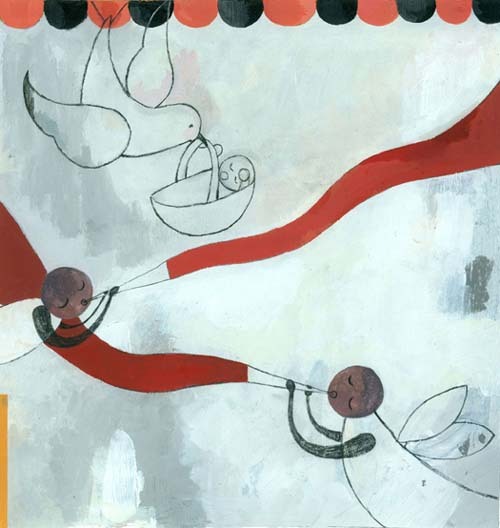 Ultimately, I try to combine a graphic and painterly approach that also uses bits of abstraction and a feeling of child-like curiosity and nostalgia for each of my books. 7-Imp: Where are your stompin’ grounds? 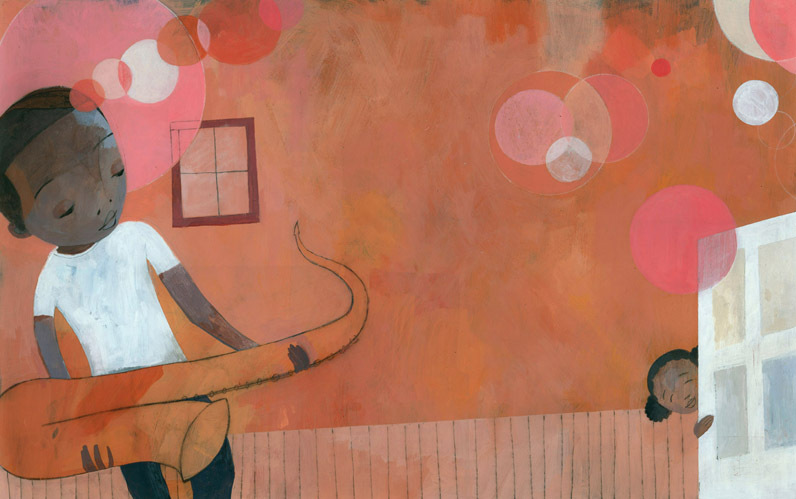 7-Imp: Can you briefly tell us about your road to publication? Sean: My road to publication has been a long one. I dropped out of art school (Pratt Institute) in 1992. 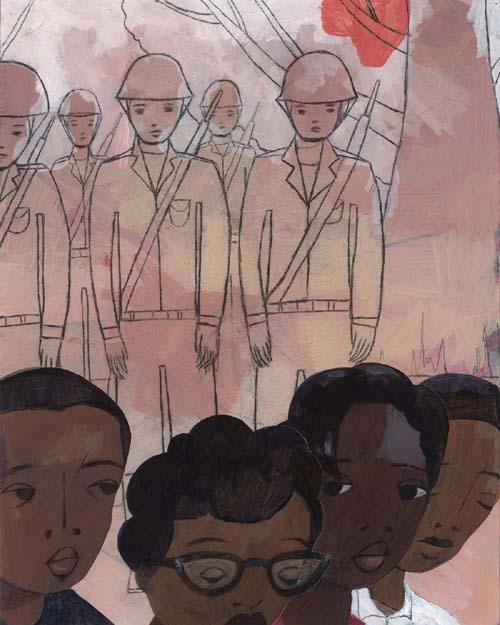 In ’95, I took an illustration portfolio class at the School of Visual Arts. From that time until 2000, I may have done a total of five illustration jobs for various magazines and newspapers. Around the same time, I became more aggressive in marketing my work. 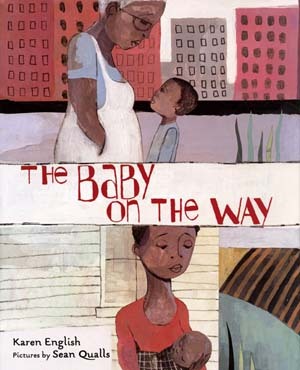 Within the next two years, I began to see some fruits from my efforts, and in 2002 Farrar, Straus, Giroux offered me my first picture book, The Baby on the Way, followed by Scholastic with Powerful Words. 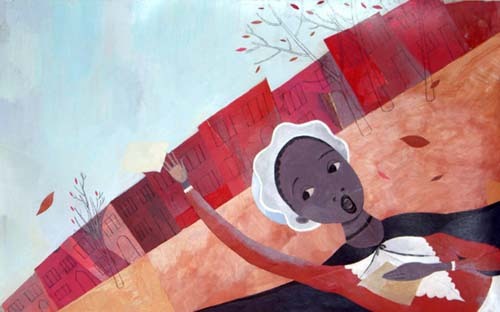 7-Imp: Can you please point us to your web site and/or blog? 7-Imp: Any new titles/projects you might be working on now that you can tell us about? 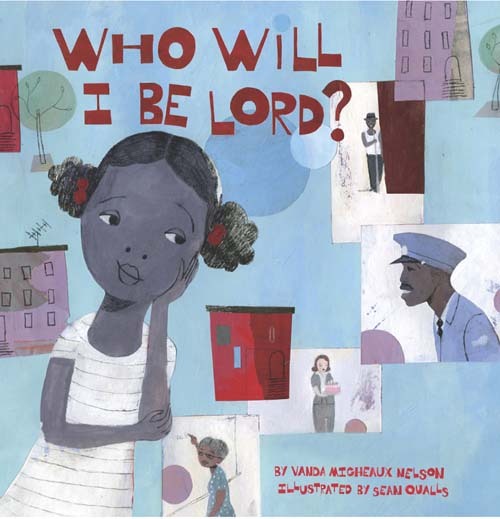 Sean: I just finished a project for Random House, called Who Will I Be, Lord?, written by Vaunda Micheaux Nelson, due out in late October this year. 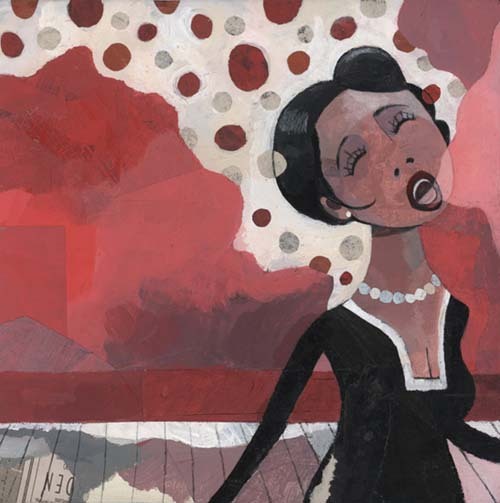 I’m also working on a book called Skit Skat Raggedy Cat about a young Ella Fitzgerald and Little Cloud and Sister Wind by Toni and Slade Morrison. 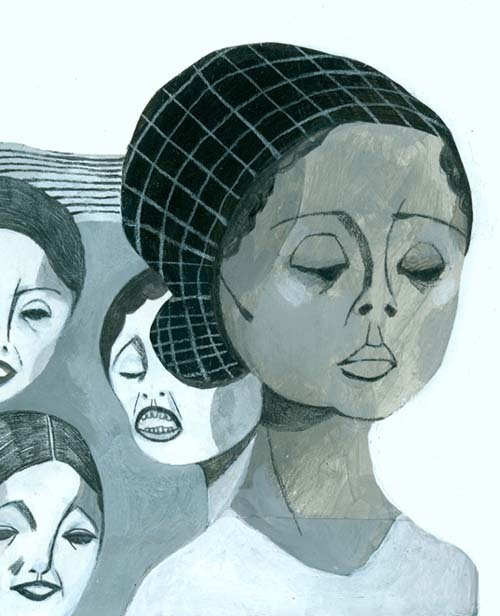 Sketches from Vaunda Micheaux Nelson’s Who Will I Be, Lord? Our table’s set. Time for our breakfast and our seven questions over it. 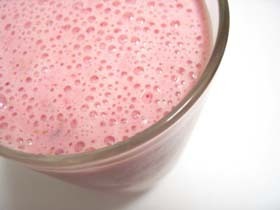 Here’s Sean’s smoothie. No mention of coffee, so I’ll bring my own mug so that I can be awake and alive when we sit down and chat. Once again, I thank Sean for stopping by and, in particular, for all the wonderful images. 1. 7-Imp: What exactly is your process when you are illustrating a book? You can start wherever you’d like when answering: getting initial ideas, starting to illustrate, or even what it’s like under deadline, etc. Do you outline a great deal of the book before you illustrate or just let your muse lead you on and see where you end up? Sean: If a manuscript excites me, I begin doing thumbnail sketches right next to the text. From there, I will start developing the main characters. It usually takes me a while to come up with characters that I like and who feel right for the story. Often, I will refer to old sketchbooks and my picture reference file. Once I have a few thumbnails that I like, I blow them up on my photocopier. I also use many of the photocopies of the earlier character studies throughout the dummy. I use pencil and gesso to make changes to the larger images. At this point, I usually get a sense of what size I want the book to be. Although my sketches are not polished drawings, I do like to get them to a place where they are finished enough that I can work directly from them for the final art. When the sketches are finally approved, I sometimes photocopy the sketches again to a size that I am comfortable working at and then trace individual figures and elements and transfer them onto separate sheets of paper. 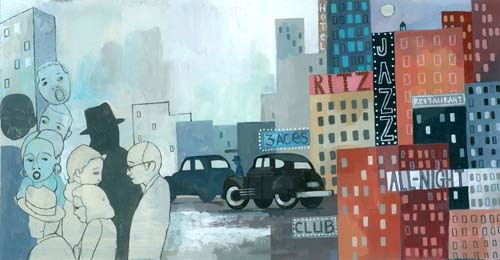 I paint the background and figures separately and then paste everything together. I have yet to outline a book before I start, but I think I may try it in the future. 2. 7-Imp: Describe your studio or usual work space for us. Sean: We live in a small house in Park Slope, Brooklyn. My wife, Selina, and I use the garden level for our studios. 3. 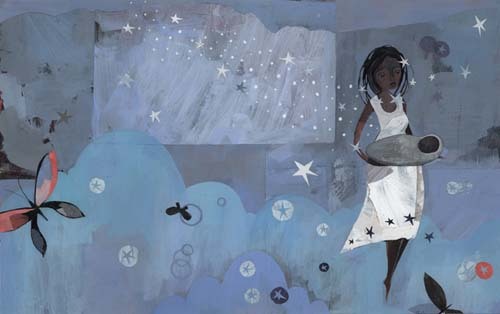 7-Imp: As book lovers, it interests us: What books or authors and/or illustrators influenced you as an early reader? Sean: My favorite books were the Kingfisher Illustrated Bible, any book about Greek or Roman mythology, comic books, and The Bobbsey Twins. I’ve always loved Golden Books and other picture books from the ’50s and ’60s but don’t have any recollection of reading any one of them as a youngster. 4. 7-Imp: If you could have three (living) illustrators—whom you have not yet met—over for coffee or a glass of rich, red wine, whom would you choose? Sean: Maurice Sendak, because of his brilliance as a storyteller; Bryan Collier, because I’ve always loved his work; Dav Pilkey, because Captain Underpants has single-handedly reinvigorated story-time in our house; and Calef Brown -– I understand that he’s no longer a blue elephant!! That’s four. 5. 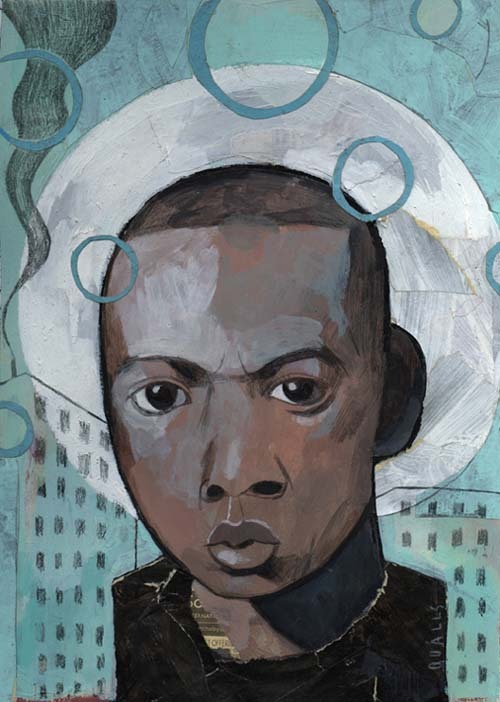 7-Imp: What is currently in rotation on your iPod or loaded in your CD player? Do you listen to music while you create books? Sean: While I’m working, I’m usually listening to music, audio books, or podcasts. Some of my current favorites are Atlas Sound, High Places, African Scream Contest, Lone–Lemuria, Department of Eagles, Dirty Projectors, Girls in the Garage, Arthur Blythe, Lava Children, Old Time Radio Science Fiction, Just One More Book! !, and This American Life. 6. 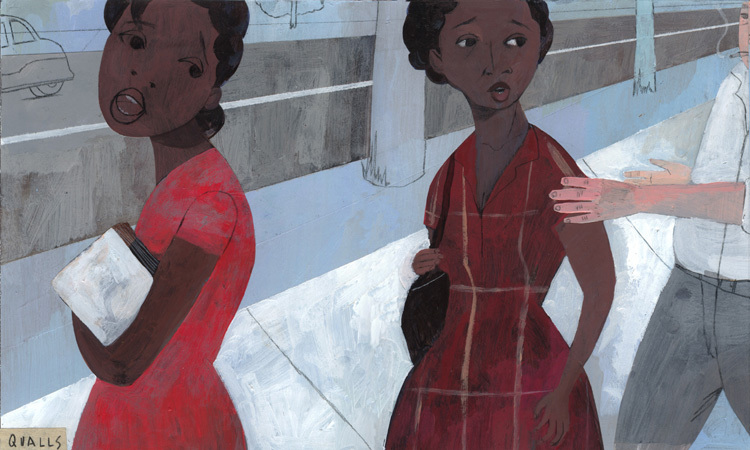 7-Imp: What’s one thing that most people don’t know about you? Sean: I’m a real night owl. I probably get it from my mother and father, but I have a real problem getting into bed before 12:30 a.m., which can easily turn into 1:30 a.m.
7. 7-Imp: Is there something you wish interviewers would ask you — but never do? Feel free to ask and respond here. Sean: My work speaks better than I do, so no. 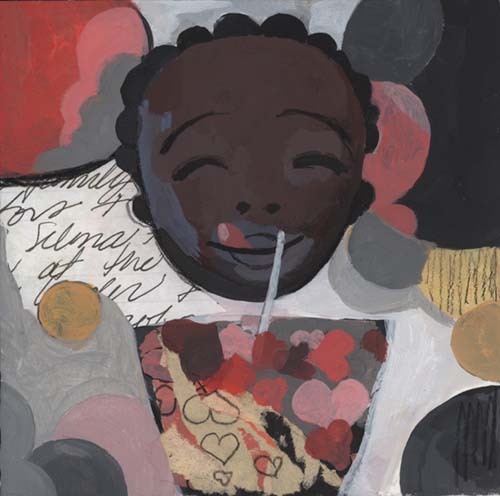 Sean: Innocence and a naïve and passionate approach to art-making. Sean: Not listening and a lack of curiosity. Sean: “Do You Believe” from Cher. 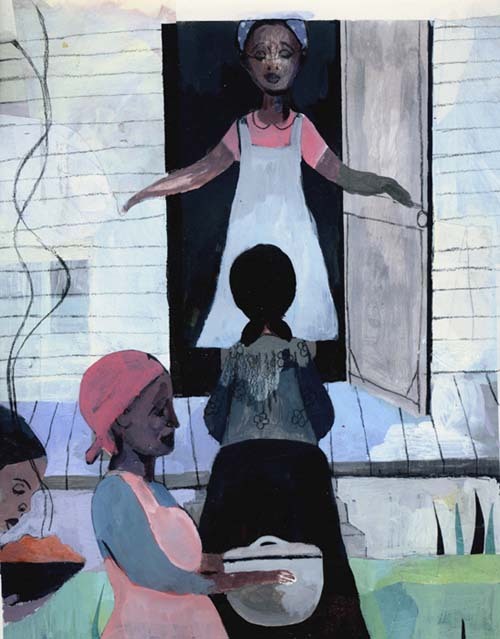 All photos and sketches and illustrations—with the exception of the smoothie image—courtesy of Sean Qualls. All rights reserved. I hope Sean comes up with a master plan to do the entire history of jazz. If I hadn’t seen it, I don’t think I’d have imagined it possible that a single illustrator could be so perfectly paired with John Coltrane, Duke Ellington, Ella Fitzgerald… Those spreads play the musicians, don’t they? And don’t even get me started on that beautiful house! Such beautiful work and very inspiring. Great interview and beautiful artwork! Makes me want to run out and make something! I love collage. I l really like how Mr. Q makes women and girls — they’re BEAUTIFUL. I love Phyllis. I ADORE Zora. I love the arms and legs and the foreheads and noses on all the men — somehow he uses something there to capture the essence of the character. I’m babbling. But this interview has made me very, VERY happy. And knowing that this man is living happily in his cute house with his enormously talented and cute wife and a cute boy — the world is a tad shinier just knowing this. Squeee! What a treat!! I’m not familiar with Sean’s work, so I’m just eating up all these glorious spreads and photos. 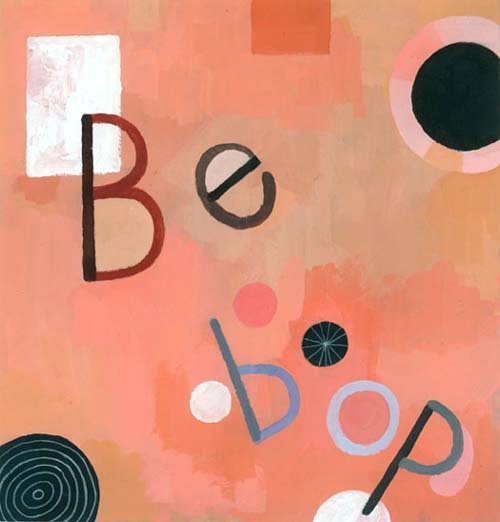 I like his circles and be bops and singular style. 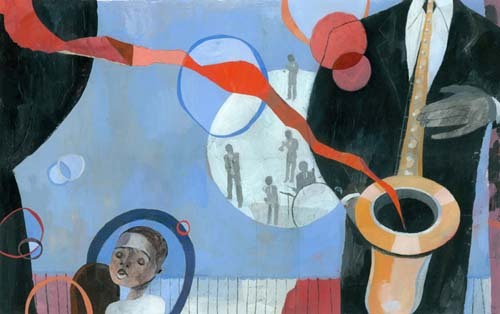 Yes, well suited to jazz musicians. “Hearts for Selina” makes me very happy. Cool all around. Thanks!! Thank you for this interview! 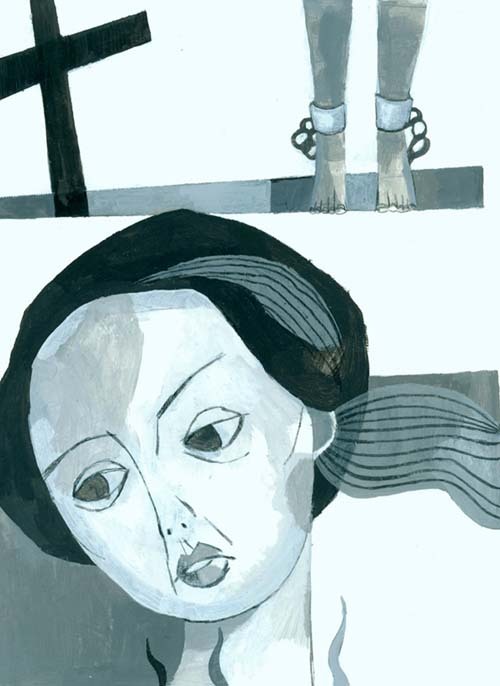 What a treat to be able to see the working process of such a fantastic & inspiring illustrator. I think I may have learned a few new things about my husband in this riveting interview. SO well done and so in depth. Thanks!!! Oh and thanks to Tanita for the compliments. We also have a super cute little girl! 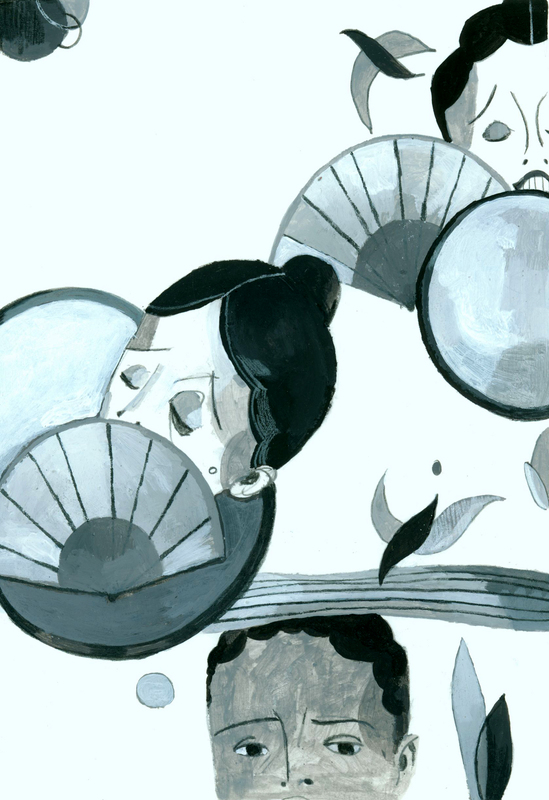 Sean’s illustrations are wonderful, and theinterview is fascinating. I loved the opportunity to see photos of him in action in his studio! 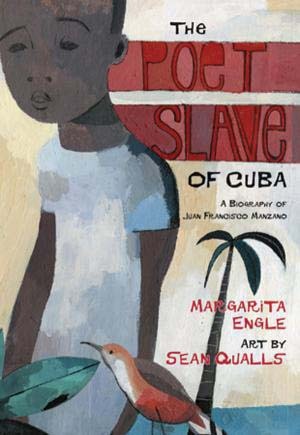 I feel privileged to have his art work on the cover of The Poet Slave of Cuba. What a wonderful interview, Jules and Sean! I loved seeing your work space, and of course all the beautiful art. Can’t wait to read your new titles! …and now “Do you believe” will not leave my head, ha! Fabulous interview. Thanks for the peek at your sketches. Can’t wait to work with Sean again. Can you have a crush on art? Because I have a crush on this. Those cool blue tones and yes, the circles, and Phillis’s lips, and the stars-and-sweetness of Lullaby, and — hey, isn’t that Matthew Henson up there in that drawer? Anyway, great interview, Jules. Thanks for being so awesome, Sean! Thank you everyone for such great comments and feedback! It will keep me going through the next few projects. And thanks Jules for doing such an awesome job on this!!! I really enjoyed the interview Jules and learned a few new things about an old friend. Watching Sean grow as an artist and be so successful inspires me in my own work as graphic designer. The sketches are beautiful. I also realize I’m missing a few his books in my collection. Sean’s work is an out of body experience. The pieces are simply organic and conversational. Your current website does not capture what the reader discovered in the interview. May you continue to capture the inner child who discovers that he or she is a living..breathing artist. Excellent and insightful interview. I love seeing photos of artist’s studios and work/living environment, as well as sketches, works-in-progress, etc. Great work: interviewer and interviewee. Enjoy you work.Enjoyed the interview and the one liners. 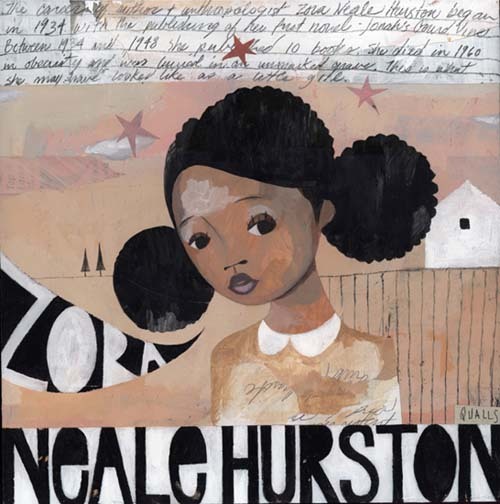 Will you ever create a children’s book on/about interracial children? They will have a lot of stuff to deal with as they grow up in this crazy place. Hope you do, put me on your list to be one of the purchasers. wish you could buy the prints in those drawers,wow.